For over thirty years Duncan worked with people from all walks of life; he was a humanist without a label. 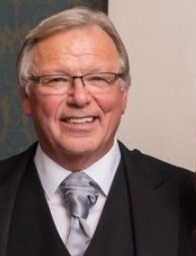 Having retired from his profession he accepted an opportunity in 2007 to train as a Humanist Celebrant. 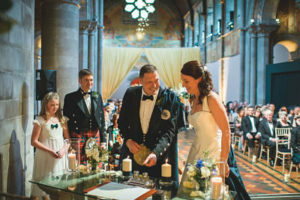 Duncan has to date conducted over 1000 humanist ceremonies throughout Scotland. He takes great care and pride in his work and has very many lovely letters and testimonials from people from all over the world, some of which can be read below. Duncan has worked with other Humanist organisations for over 10 years and is now applying his knowledge and skills to the development of the Humanist Association Scotland. The Association supports a diversity of registered charities concerned with humanist and humanitarian purposes throughout Scotland and elsewhere. 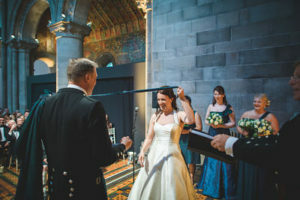 Duncan very much looks forward to continuing his work as a Humanist Celebrant within the Association and to travel to a diversity of locations throughout Scotland for the purposes of the promotion of the principles and practice of Humanism which includes solemnizing Humanist Marriages. Duncan is Edinburgh based and can be contacted almost anytime at either 0131 6721107 or Mob: 07918034017, by email at duncan @ humanistassociationscotland.com or by using our website contact page. We just wanted to say a huge thank you for being our celebrant. You helped us to put together a ceremony that touched our hearts, as well as all our family and friends that were present. We had so many people coming up to us afterwards, some who had never been to a humanist ceremony, saying how much they had enjoyed it. We also loved the little message that you put into our bucket! What a wonderful day it was. George and Marie incorporated a candle lighting and a hand fasting into their ceremony. 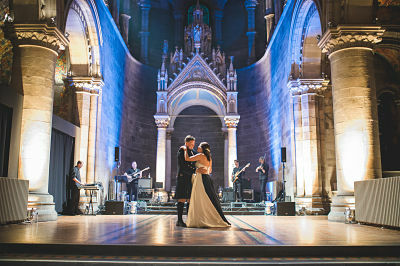 As you can see Mansfield Traquair was resplendently illuminated for their first dance. Thank you so much for playing such a key role on our special day. Your advice and guidance was invaluable to make the ceremony our own. It was exactly what we wanted. Chris and I just wanted to say a huge thank you for being our celebrant on our wedding day. You made me feel so at ease (not an easy task) and the ceremony was all we hoped for, and more! I can’t recommend you highly enough for all of your help on the lead up to the wedding and for your support on the day. Everyone we have spoken to following the wedding speaks so highly of how you delivered the ceremony and how we managed to keep the right balance of solemnity, romance and light-heartedness! Again, thank you sooo much and we hope that you enjoyed the ceremony as much as we did! We have just returned from our honeymoon in the French Alps and wanted to drop you a note to say a massive thank you for being such a special part of our wedding celebrations last weekend. Thanks for all your guidance and support in the lead up to our wedding, and for helping us to plan our perfect ceremony with a balance of sincerity, romance and humour. We thoroughly enjoyed our wedding ceremony, and you were an incredibly reassuring presence in what was a very exciting and emotional time for us both. We have received so many compliments from guests describing the ceremony as the best and most personal they have experienced. Dear Duncan, Weddings can often feel like they are more about food, dancing and speeches than anything else. It was very important to us both that the ceremony was something that people would remember and was something that meant we started married life in the most fitting way possible. We both feel it had a blend of romance, solemnity and humour; in short it was more perfect for us than either of us imagined possible. This was thanks to you. For your support, advice and charm. We shall be forever grateful for the integral role you played in our special day – thank you so much. We wanted to thank you for the incredible job you did on the day. It was for me the most amazing ceremony I have ever witnessed and I am so happy that it was our ceremony. All of our guests have been extremely complimentary about the ceremony and said that it was one of their favorite parts of the day. There were tears and laughter for all and we can’t wait to see the video and watch it all over again! Duncan and I couldn’t be happier!! It was certainly the best way to start off our married adventure together. Thank you for helping to make our day so special. Just a little note to say a HUGE THANK YOU for doing our service on Sunday. We couldn’t have asked for it to go any better! You had everyone at ease (especially me!). Many of the guests had never been to a humanist ceremony before and the compliments you received were……..well what can we say…….exceptional!! One couple mentioned it more than five times throughout the day, and each time with more and more enthusiasm which included shaking of the head, so we knew they blown away. I could go on and on, but all in all we knew we had made the perfect choice in choosing yourself to do our service and the guests just confirmed it. Thank you again Duncan and may you continue to conduct many more marriages just like ours and make each one feel as special and individual as we did on ours. We cannot thank you enough for being such an integral part of our wedding day! We loved every second of the ceremony and the way you conducted it was AMAZING!!! So many of our guests commented on how great you and the ceremony were and how personal it was. Most of them had never been to a humanist wedding before and thought it was perfect. Thank you from the bottom of our hearts Duncan it wouldn’t have been the same without you and we would not hesitate to recommend you to anyone! On behalf of Caroline, Gillian and myself, I wish to express our thanks to you for conducting the Tribute to Sheila. We feel that, in your address, you completely captured the detail of Sheila’s personality and life, and we are grateful for all the hard work which you put into the ceremony. Many compliments were expressed to us afterwards. I Wanted to get in touch just to thank you again for your kind words at my dad’s funeral. I have been approached by a number of people who attended that day and commented on your service. One of my Dads good friends was delighted in how you managed to capture exactly who he was. I would like you to know that my family have received many positive comments regarding the ceremony that you performed at my dad’s funeral. It was especially clearly conveyed to all and delivered in a manner that was fitting of the occasion. Many said it was interesting and lovely to learn about the journey of my dad’s life. I think that the Humanist ceremony dad had, would have been the ceremony that he would have wanted.